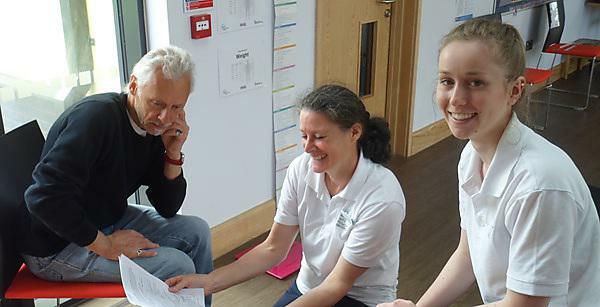 Physiotherapy students from the University of Plymouth are helping over-60s assess their health at a series of community events. The Functional Fitness MOTs are being carried out in Plymouth, Plymstock and Kingsbridge over the coming weeks where participants are taken through a variety of tests that will give an indication of their exercise performance. The tests, which include flexibility, muscle power, balance and aerobic endurance, come with a set of ‘normal values’ for people of different ages to give them an idea of whether they are doing well compared to their peers, or whether they could benefit from being more active. Participants then receive a free personalised workbook of results and will learn about local physical activity and exercise opportunities in and around their local area. Just walk in on the day or book a slot at the reception desk. Anyone interested in taking part can email Dr Liz Candy for more information. The Functional Fitness MOTs are a not-for-profit project hosted by Zest Physiotherapy for Life, which specialises in physiotherapy for older people. The events are run in conjunction with Age UK in Plymouth and with Age Concern in Kingsbridge, and more than a dozen people attended the first event at Elspeth Sitters House in Hoegate Street, Plymouth this week.